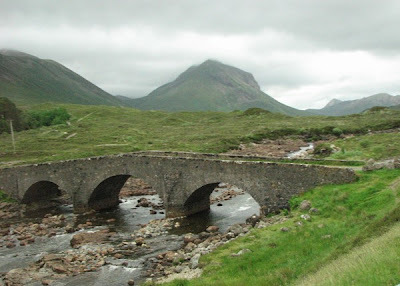 On the morning of June 26 we left Isle of Skye and returned to the mainland of the western Highlands. 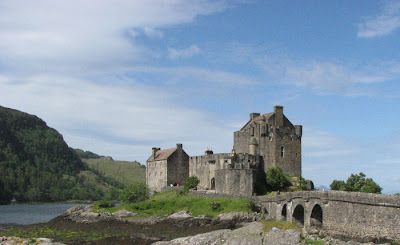 We only traveled a short distance before reaching Eilean Donan Castle. 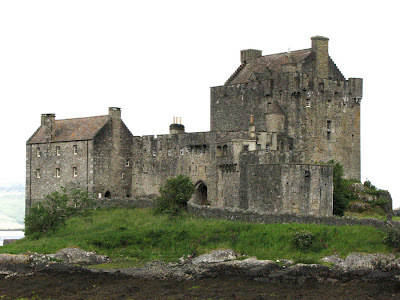 This is my favorite Scottish Castle! (Many of you are probably saying the same thing.) It is so well known it's an icon and the most photographed castle in Scotland. I think it epitomizes what everyone considers an ideal Scottish castle and the surroundings are so beautiful and romantic. Eilean Donan is Scottish Gaelic for Island of Donan. (Eilean is pronounced ellen.) 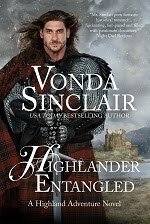 It is named after St. Donan, a celtic saint martyred in the middle ages. 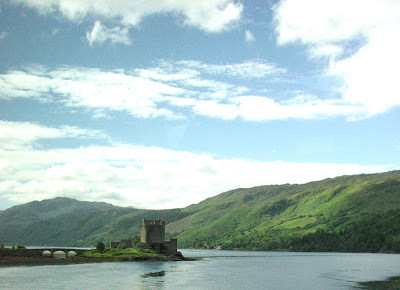 The castle sits on a tiny island in Loch Duich near Loch Long and Loch Alsh, all sea lochs. 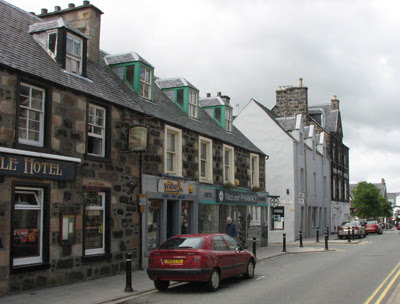 The village of Dornie is nearby. I was so excited walking up to the castle. For a long time, one of my dreams was to visit it. We were not allowed to take photographs inside, except through the windows to the outside. This is a lovely view. 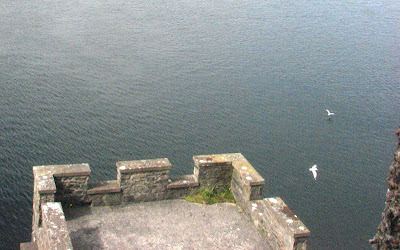 The battlements that look out over the loch. In the banqueting hall I asked one of the guides about the entrance. The place where we entered on the south wall, wouldn't have been the main front entrance centuries ago. 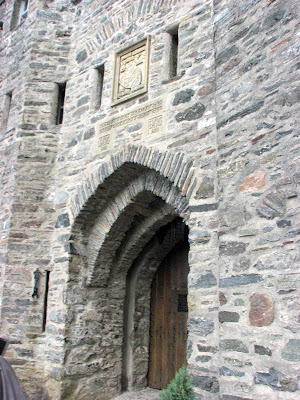 An iron gate now blocks this entrance into the banqueting hall from outside. The guide explained that this gate was the original medieval gate which blocked off the well. He even allowed us to operate the gate. It was really neat and wonderful to touch and interact with this piece of history from medieval times. The well here is protected by thick stone walls. This shows how important it was. When you look at the main photo of the castle, the well is inside the shorter heptagonal structure at the front. If you look at the 2nd photo above, it's to the right of the big door. Over its portcullis is a Gaelic inscription which translates as: As long as there is a MacRae inside There will never be a Fraser outside. This is where we entered. 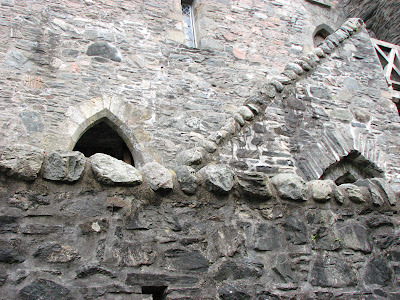 The steps throughout the castle are extremely narrow. 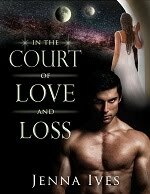 The passages and rooms meander and include many interesting nooks and crannies. Some are only a little bigger than a window seat. We toured the bedrooms upstairs and the kitchens downstairs. And HERE, you can take a virtual tour! This is wonderful because it shows 360 degree views of the inside, which I couldn't take photos of, and you can look around the rooms. It also shows the back and sides. This is a fascinating place and I didn't get to spend nearly enough time here. I must go back! 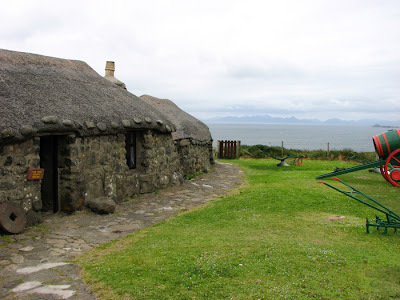 We stopped in Kilmuir at the Skye Museum of Island Life and visited the crofters' village. 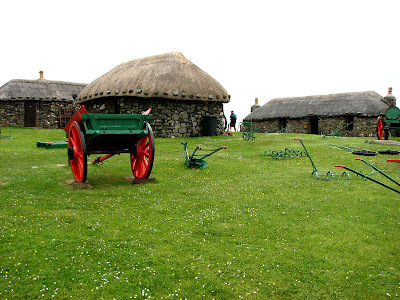 The thatched croft houses depict life in the nineteenth century. The main stone cottage was built in the early 1800's. The Graham family lived here until 1957. Fourteen people lived in the cottage at one time. They are built using local materials. 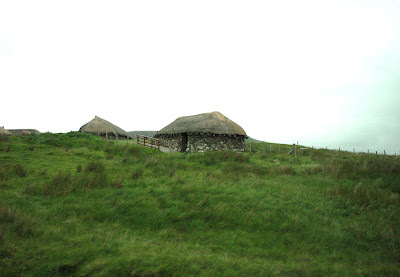 Houses all over the Highlands looked like this in the early days. In Highland tradition, they told stories, played music and sung songs by the light of the peat fire. A thatch roof, low to the ground on the upper side. The rocks help hold the roof in place. The village contains seven thatched cottages: The family home, the old barn, the smithy, the weaver's house, the ceilidh house, the byre and the gift shop. 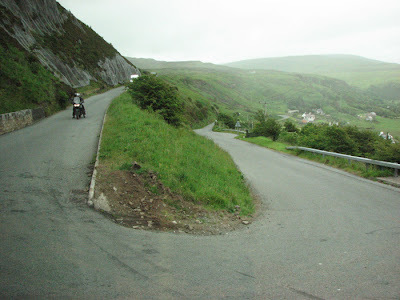 This is a most dramatic curve in the road. And it's a one-lane road. You can see the passing place further down. One of the guys got off our bus and signaled while the driver backed the bus up a few times and wedged it around this curve. The motorcycle rider is waiting patiently. Guess he doesn't want to tangle with a bus. The sun peeped out a few times on this day! It had been DAYS since we had seen the sun. Anyway, see how the sun makes the green more vibrant? This is the incredible view from the pier at our hotel on Isle of Skye. 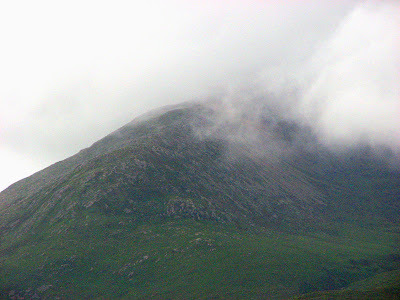 The mist enshrouded mountain behind Broadford. 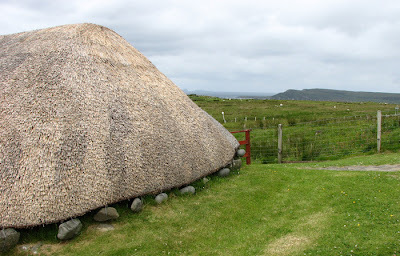 Peat or turf is the traditional fuel used for heating in Scotland. It's burned much like wood. 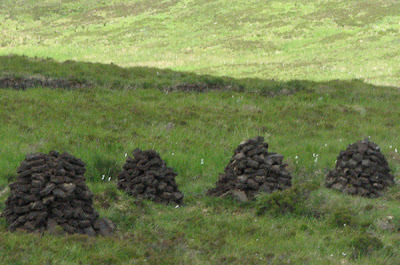 Here you see someone has cut a bunch of peat from the ground and stacked it to dry. It's very soggy when it's in the ground or first dug. But once it's dry, it is sort of lightweight like a dry sponge. 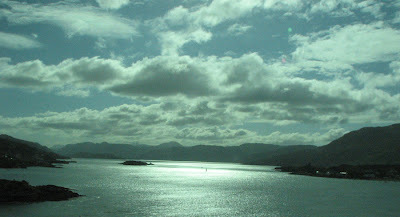 My last glimpse of Isle of Skye and Kyle of Lochalsh from the Skye Bridge the next morning. 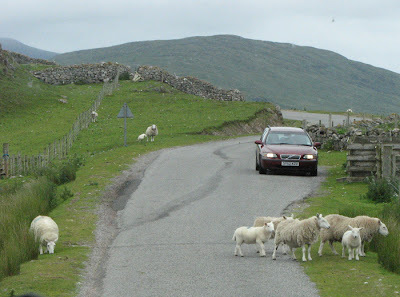 During the afternoon in the remote, northernmost areas of Isle of Skye we drove on single-track roads. 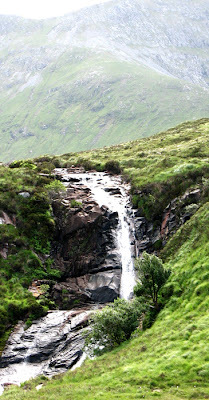 The untamed landscapes of green hills, streams, rock formations, sea and sky were gorgeous. Here are a few photos of this area. 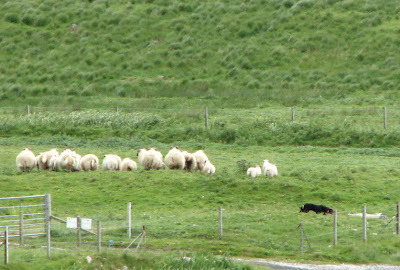 Here we saw a dog earning his living herding sheep. This is the first time I'd seen this done in real life (not for show.) Very cool. 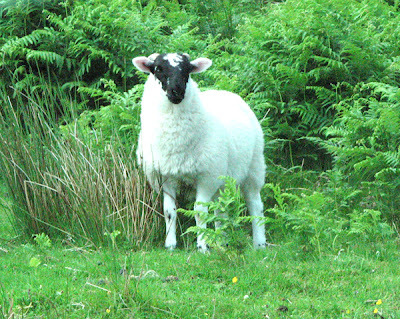 I learned that the blackfaced sheep were the original ones traditionally raised by Highlanders. Isn't this one cute?! There are many beautiful views from this one point. Duntulm means the fort on the green grassy headland. 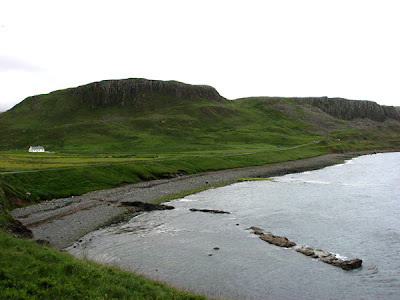 During the seventeenth and early eighteenth centuries, this was the principal seat of the Chiefs of Clan Donald North, otherwise known as Clan Uisdean, from its progenitor Uisdean, or Hugh, a son of Alexander, third Lord of the Isles and Earl of Ross; and as the MacDonalds of Sleat, from their first settlement in that part of the island, their seat then being the Castle of Dunscaith. The MacDonalds lived here until 1730. 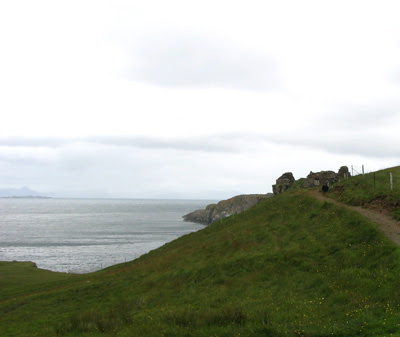 This site was originally home to an iron age broch that Norsemen (Vikings) used during their forays down the coast. 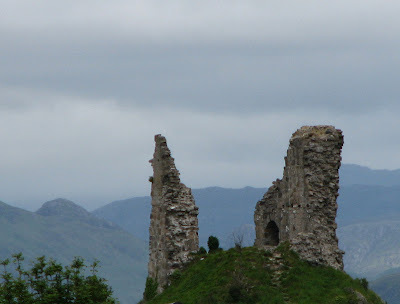 Later, during the 14th and 15th centuries, the Macleods built a stone castle, but the current ruins date from the seventeenth century. 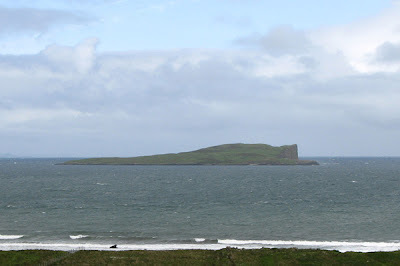 The earliest mention of Duntulm is in 1549 when Sir Donald Monro, Dean of the Isles described it as "the castell Donntwyline perteining to Donald Gromesone," (i.e. Donald Gormeson, 6th of Sleat). Much of the stone and other materials were removed between 1732 and 1736 to be used in the building of Sir Alexander MacDonald's new house at Monkstadt, some five miles away. 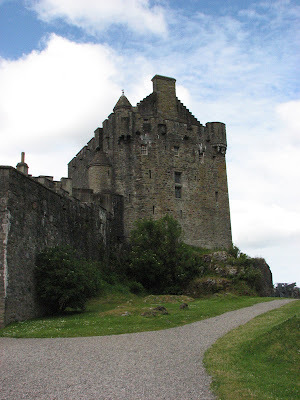 The castle and site are supposedly haunted. People have reported seeing the spirit of Donald Gorm fighting with other ghosts in the courtyard. Hugh MacDonald haunts the dungeon where he was imprisoned and starved (or thirsted) to death, along with several others including two female ghosts. It is said the MacDonalds left the castle because they couldn't tolerate the ghosts. 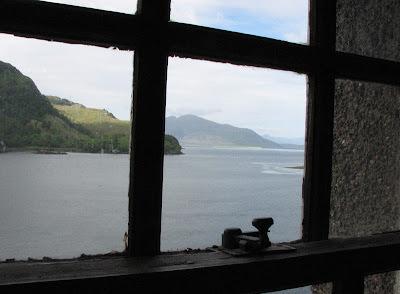 A famous quote from Alexander Smith (1865) from "A Summer in Skye" captures the place perfectly: "Through the window I beheld the spectral castle, the sea upon which the light was dying…and seated here in the remotest corner of Skye…girt by walls of cliffs and the sounding sea…I confess to have been conscious of a pleasant feeling of strangeness, of removal from all customary conditions of thought and locality, which I like at times to recall and enjoy over again." 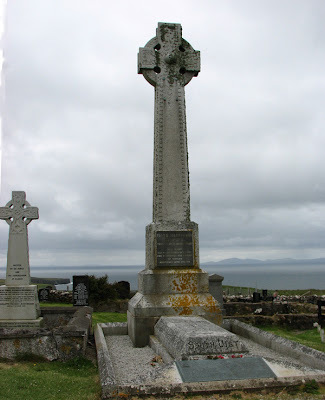 Here you can learn lots more history of Duntulm. 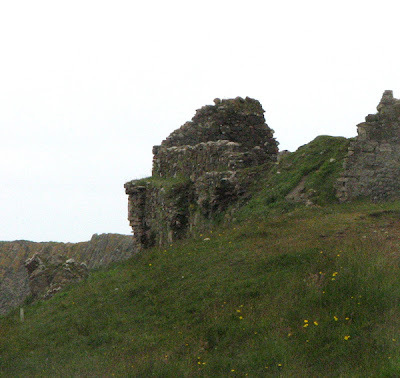 When we first arrived on Skye, we saw the Castle Moil ruins (aka Castle Moal, Dun Akyn, Dun Haakon and Castle Dunakin.) 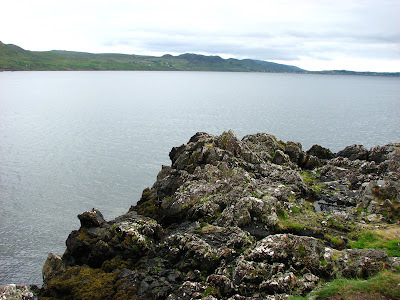 It is located near the harbor of the village of Kyleakin. 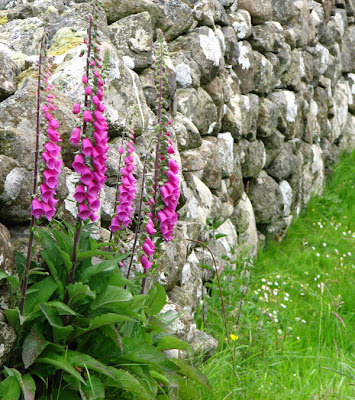 To prevent unpaid crossings through the narrow straight between Skye and the mainland, the reputed builder of Castle Moil, a Norwegian princess and wife of a MacKinnon chieftain remembered today as "Saucy Mary", had a chain hung from the castle walls across the channel to the mainland. The chain was raised to block passage and thus allowed her to extract toll from all vessels which passed through the Kyles. Why was she named Saucy Mary? Allegedly Mary, following payment of her tolls would, as a gesture of thanks, flash her breasts at the sailors as the ships would pass. 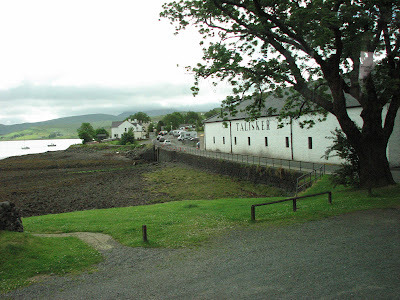 Our first stop on June 25 was the Talisker Whisky Distillery (the only whisky distillery on Skye). This whisky is known for its above average peat content, and "salty" (or "spicy") character. It sells well but the high phenol level and distinct taste may prove "challenging" for the casual whisky drinker. Additionally, the water used for production, from Cnoc nan Speireag, flows over peat which adds additional peatiness to the whisky. It's also dark in color. Both Johnnie Walker and Drambuie (a liqueur, not a whisky) use Talisker as a component of their blended drinks; its presence is most notable in Walker's Green Label 15 Year Old Pure Malt. The distillery was built in 1830 by Hugh & Kenneth MacAskill, and expanded in 1900. The distillery was nearly destroyed by fire in 1960, however five exact replicas of the original stills were constructed to preserve the original Talisker flavor. Talisker was a favorite whisky of writers Robert Louis Stevenson and Henry Vollam Morton. It was TOO early in the morning (9am) for me to partake of the free whisky sample, but several of the tour members enjoyed the drink. The tour was really interesting and we learned all about how whisky is made. It's a long complicated process. This lovely old three arched stone bridge is no longer used for traffic. 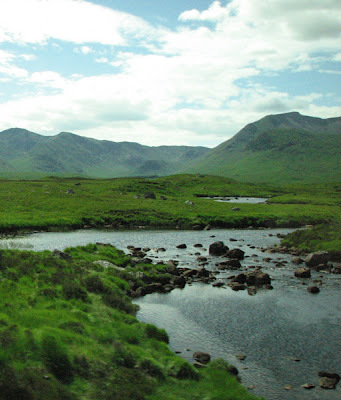 It's located in Sligachan at the head of Loch Sligachan along the main road between Broadford and Portree. 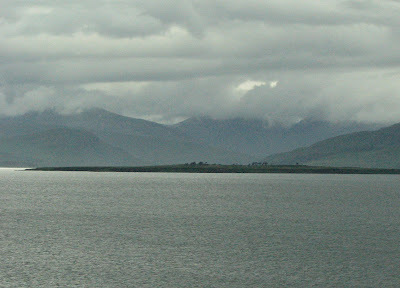 The Cuillin Mountains are in the background. We had lunch in Portree (above) the capital of Skye. This is a nice historic town. I spent most of my time here in a restaurant and in the post office, where I waited in line to exchange money. 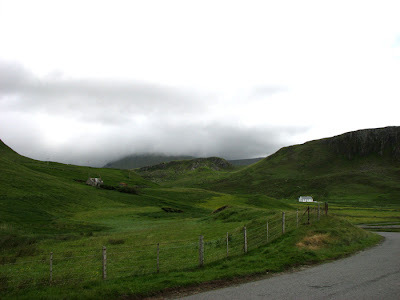 We spent the afternoon touring the Trotternish peninsula. This was my favorite part of the day because Skye is such a fantastically beautiful place, the perfect setting for myths and legends! One of our first stops was the Old Man of Storr (above). 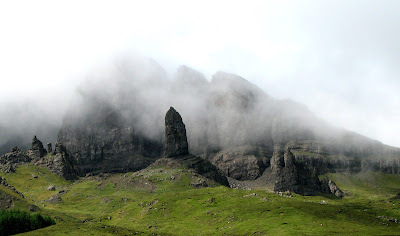 The area in front of the cliffs of The Storr is known as The Sanctuary. This has a number of weirdly shaped rock pinnacles, the remains of ancient volcanic plugs. One of the most famous of these is known as The Old Man of Storr. 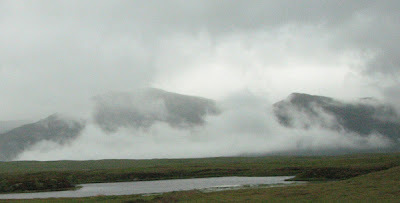 When we stopped, a fast mist was moving in front of and behind the rock formation. Here's one I took once the mist moved by. It seemed like the clouds had come down to earth for a visit. 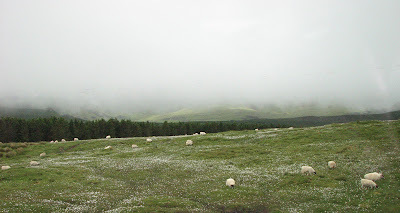 This is a beautiful sheep pasture. I thought the white flowers and white mist added a magical touch. 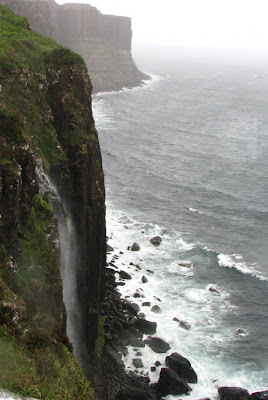 We stopped at Kilt Rock (above) during a gale, the first I've been in. The wind was blowing really hard and the rain was sideways. But dedicated sightseer and photographer that I am, I put my hood on tight and braved the storm. Because of the strong force of the wind blowing in off the sea from the Sound of Raasay and The Minch, I could hardly get close enough to the rail to take a photo of the waterfall and Kilt Rock. The wind kept blowing me back. It was almost like the tropical storm I was in once. On the way back to the bus, I thought the wind would literally blow me off my feet. It was a nice fun adventure! 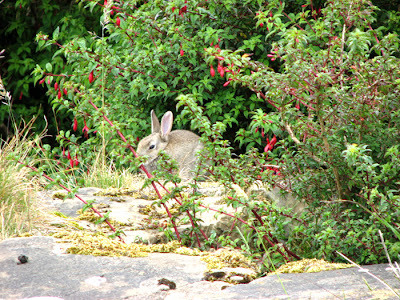 On the morning of June 24 we traveled through some beautiful areas and arrived at Inverewe Garden. (Pronounced Inver-you, in case you're interested.) 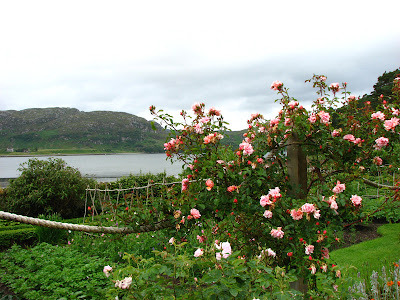 This is a wonderful large garden on Loch Ewe created by Osgood Mackenzie who was born in 1842. He bought the property and started planting things in 1862. 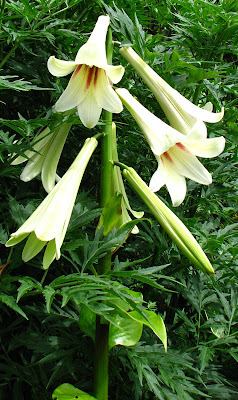 The garden was near complete by 1870 and by the end of the century it was flourishing. Inverewe is far to the north, about the same latitude as Canada's Hudson Bay. But because of the Gulf Stream, it's much warmer in winter than you would expect. The land here was originally very rocky and peaty, but Mackenzie had soil imported (perhaps from Ireland). The wind off the Atlantic can be extreme here but he planted a pine tree wind break to protect his exotic plants he gathered from all over the world. The garden is divided into many sections including ponds and bogs. 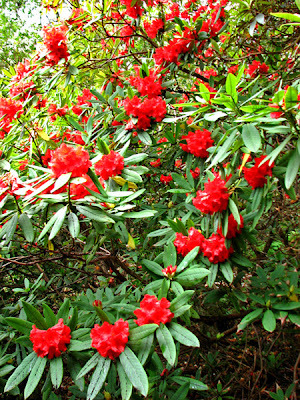 Several huge rhododendrons were in full bloom. In Scotland rhododendrons grow like weeds and in some areas they have to be pulled out so they won't overwhelm native plants (not in this garden, but other places.) 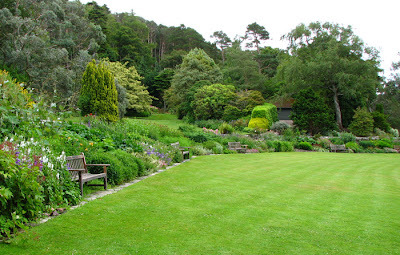 About 200,000 people visit Inverewe Garden each year. 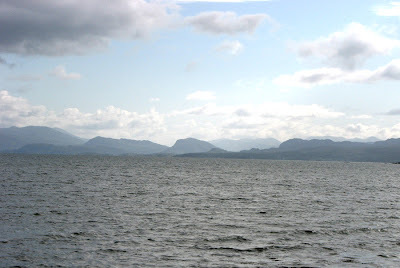 We ate lunch at a restaurant at Inverewe then headed on toward Isle of Skye. We passed many lochs including Loch Maree. 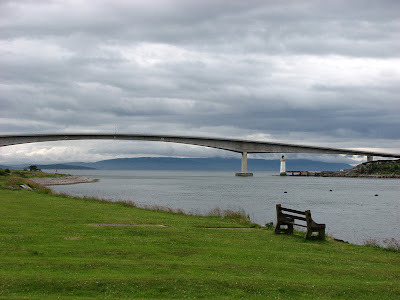 We traveled over the Skye Bridge and stopped for photos, then headed toward our hotel in Broadford. (See the lighthouse beneath the bridge?) The wind was blowing so hard out here and it was freezing cold. But we still went outside and explored around the hotel and took a walk down the street to a park and across a bridge. 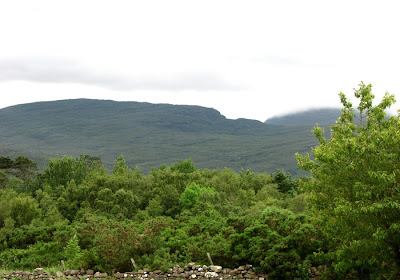 Broadford is a really small town and the scenery is gorgeous. 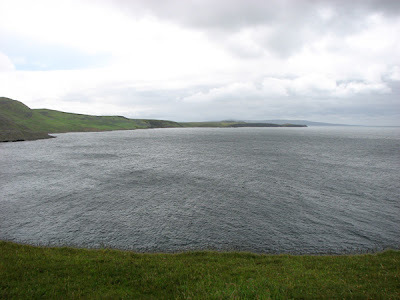 With the wind, it was about the same temperature here as it was in Orkney and I needed 5 layers of sweaters/jackets. 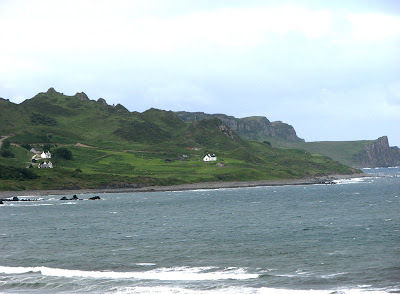 We stayed two nights on Isle of Skye. Sorry for the long delay in getting back to my Scotland trip! 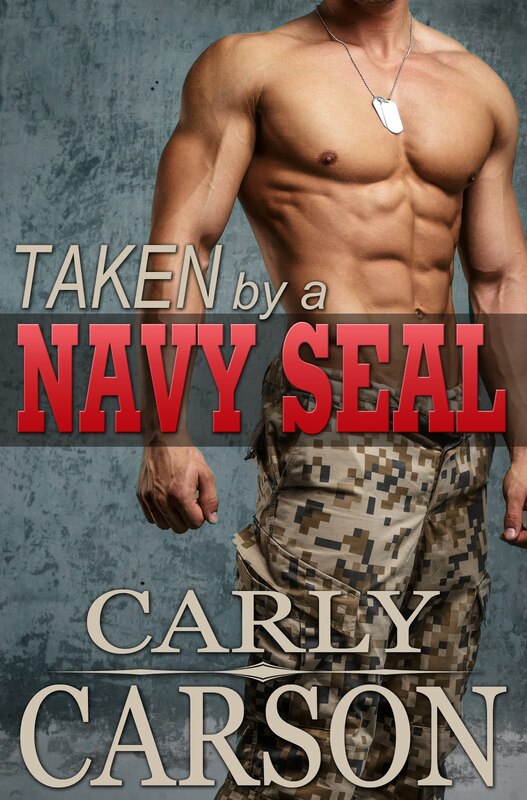 I've been writing and revising some things I needed to get done. 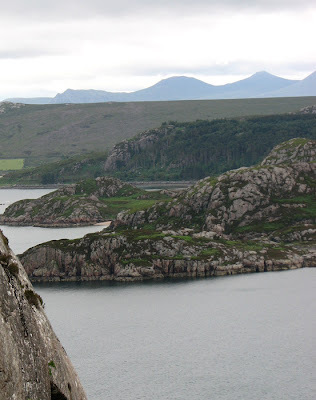 After leaving Sango Bay and the Durness area in North West Sutherland, we traveled south that afternoon toward Ullapool in the Wester Ross region. 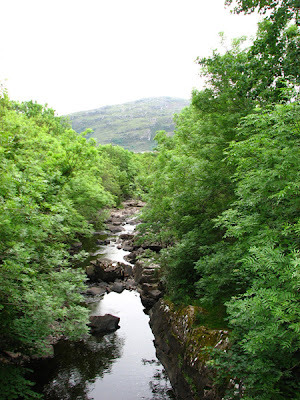 We passed through some amazing and beautiful scenery in this part of the Highlands. We saw the ruins of the 16th century Ardvreck Castle. If you squint you can see it. The driver wouldn't stop and I was on the opposite side fo the bus, sooo I was lucky to get this tiny glimpse. Below is a view out our hotel room window in Ullapool. It's a lovely small villiage and active fishing and ferry port that was built in 1788 by the British Fisheries Society. We took a walk from the hotel to a footbridge that passed over a nice stream and then back through the town to the harbor where boats are docked. We shopped here for a bit then went back to the hotel for dinner. 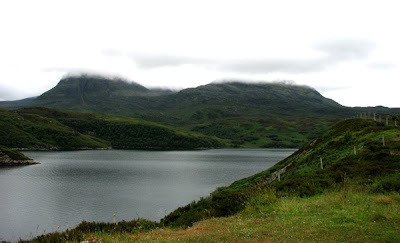 The next morning, we left Ullapool for another scenic drive around Loch Broom and toward Gruinard Bay. Again lots of breathtaking views. The heavy mist added to the wonderful ambience. I made a video slide show with music so you could see how beautiful this area is. Or you can just look at a slideshow of the large photos if you want.